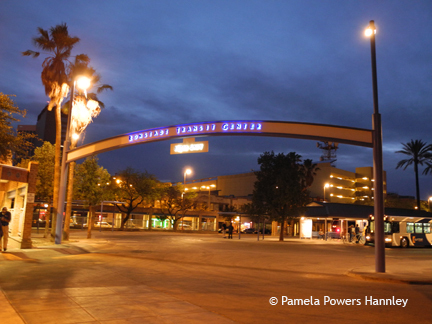 Ronstadt Transit Center at night. NOTE: This story has been updated with further background and additional links provided by the Tucson Bus Riders Union and Sun Tran, including how to voice you opinion if you cannot attend one of the meetings. A series of seven meetings have been scheduled by the City of Tucson and SunTran to gather public input on proposed fare increases and changes to bus routes. These meetings are being held all over town; most meetings target specific routes. If you have an opinion on this topic, be there. If you ride Sun Tran buses or care about how transit works for Tucson, it’s time to pay attention. The city is moving forward toward changes in routes and fares. Please forward this info to your networks! All of the meetings are listed in the Blog for Arizona Calendar here. For additional background information check out the Tucson Bus Riders’ website here. For those unable to attend the open house events, details are available at www.suntran.com. Individuals can provide feedback by calling (520) 792-9222 or sending a message tosuntraninfo@tucsonaz.gov. An online survey will also be available by March 18 as well. The proposals were based on the Comprehensive Operational Analysis and Bus Rail Interface Report, which were developed to help bridge the $33 million gap predicted in the City’s general fund for fiscal year 2015 and would decrease the City’s general fund contribution to transit. For more information, call Sun Tran’s Customer Service Center at (520) 792-9222 (for persons with hearing and speech impairments, call TDD: 520-628-1565). Except on major holidays, the Customer Service Center is open weekdays from 6 a.m. to 7 p.m. and weekends from 8 a.m. to 5 p.m.